Pope Francis, we love you! The five-day visit of the Pope in the country has ended. He brought us a message of the mercy and compassion of God, most especially the on the communities devastated by “Haiyan,”/ “Yolanda” the strongest typhoon on record, whose destructive path displaced four million people and flattened a million homes. As a parent, I am truly touched by his beautiful and meaningful messages. 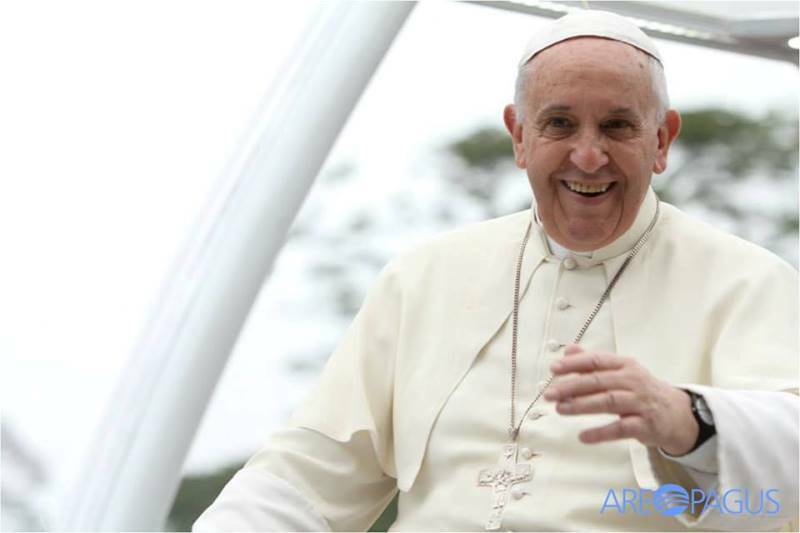 Let me share 10 Quotes and Messages from Pope Francis That are Worth Sharing. The moment I saw him on TV, my heart was filled with joy which makes my eyes so teary. For the past days that he visited our country – the Philippines, my family watched him over the television and I’ve read wonderful things about him as a person. 2. God reveals Himself through surprises. 5. 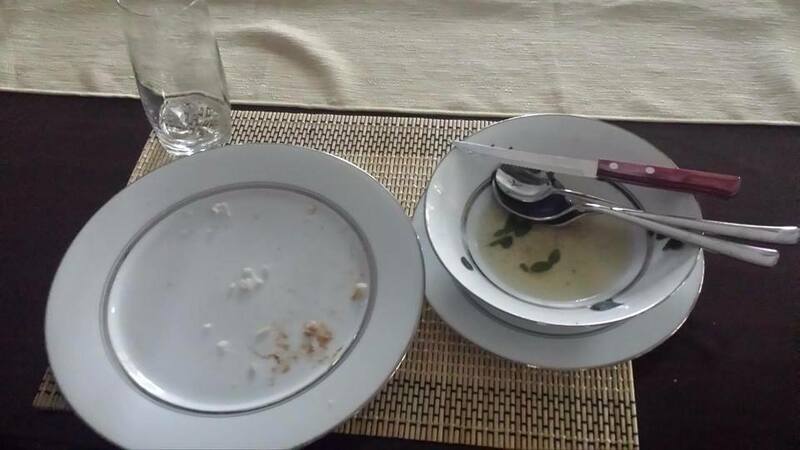 “Finish your food”. These three words are simple yet so meaningful. He actually really meant it. The above photo was taken by Cary Jaucian, who was commissioned by the PSG to personally serve the Pope his meal in Tacloban shared in the papal visit facebook page. This only shows on how Pope values the graces given by God, be thankful and not to waste food because there are many others who are experiencing hunger. I showed this to my son who is eats so slow that sometimes do not finish his food. Now, he is more motivated to finish his food as I explain to him why he should finish his food just like what Pope Francis did. 6. Prayer is resting in God. If we do not pray, we will not know the most important thing of all, God’s will for us. 7. As families, be especially mindful as missionaries of Jesus… show concern for those who do not have a family of their own. 9. The family is the greatest treasure of any country. Let us all work to protect and strengthen this, the cornerstone of society. “There is this new ideological colonization that we have to be careful of that tries to destroy the family. It’s not borne of the dream we have with from prayer and from the mission God gives us and that’s why I say it’s colonization. Let us not lose the freedom to take that mission forward that God has given us. And just as our people’s were able to say no to the periods of colonization, as families we have to be very wise and very strong with fortitude to say no to this colonization that could destroy the family and to ask the intercession of St. Joseph to know when to say yes and when to say no.” ? 10. When you lose the capacity to dream, you lose the capacity to love. In addition, I would like to share the summary of the first Eucharistic celebration in the Philippines in the photo below by CBCP news. According to most people who saw Pope Francis, they went home happy and renewed in their faith. Yes, I felt it too. Although I wasn’t able to personally see and meet him, he inspires me to live with warmth compassion and humility that starts with our family. As I observed the papal visit, the effects to Filipinos is truly wonderful – discipline, patience, hospitality, love for the family, and the faith is always there that gives us light and strength to whatever struggles and trials we may encounter. Pope Francis, you are a true example of a good Christian. Thank you and we love you! How about you? How the Papal visit affects you? 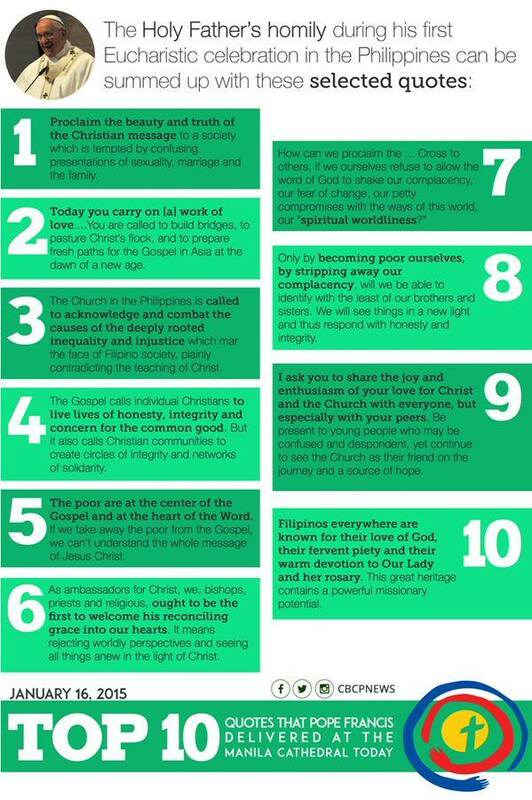 Filed Under: Events Tagged With: 10 Quotes and Messages from Pope Francis That are Worth Sharing, Papal Visit 2015 messages, Pope Francis, Pope Francis Messages to the Philippines, Pope Francis Quotes to the Philippines, Top 10 Quotes of Pope Francis Delivered at the Manila Cathedral, we love you!